You are here: Home / Why Do We Do This? It all started with the love, empathy, and vision of our founder Nicholas “The Kid” Wolber…..
After his diagnosis, Nick was placed in the children’s cancer ward at Schneider’s Children’s Hospital where he saw first hand the devastating emotional and physical effects of cancer on children and was deeply affected by this experience. When his initial round of treatment was nearing it’s end, Nick, and his friends started to informally raise money, and gifts, to help brighten the days of the children and families he had met. This good will project was where the seeds of Support The Kid began to grow into the organization that it is today. Nick was selfless throughout this entire battle, and always showed a genuine passion for his family, friends and raising money to beat cancer! Nicholas Wolber, founder of Support the Kid for Cancer, was diagnosed with Synovial Sarcoma, a rare form of soft tissue childhood cancer in December of 2005 at the age of 22. He had surgery to remove the cancer from his leg and spent several months receiving chemotherapy and radiation therapy. The required radiation therapy was so aggressive that it caused an open wound to develop in Nick’s leg and rendered him unable to walk. Over the next 24 months, Nick endured three more painful surgeries on his leg, including a final 16 hour surgery in which they took muscle and skin grafts from his back and leg to rebuild his knee. Following this arduous surgery, Nick spent a month in a hospital bed healing. After this initial battle with cancer, Nick was cancer free for almost 5 years. During his remission, Nick walked with a limp, often a cane, but never a complaint and always a quick smile near to his lips. He lived these blessed days with vigor, and enjoyed life to the fullest, meeting his true love, Danielle, and building a loving relationship with her, culminating in their engagement. He completed his bachelor’s degree, paving the way for his future professional career. Nick also became an avid Auburn football fan thanks to the influence of his uncles and made an annual ritual of attending a game each year. He especially relished treasured moments vacationing with family and friends, and the special trip he made each Christmas to share his story and positive attitude with the children in Sloan Kettering’s cancer ward. However, in April 2010, Nick went to the hospital after experiencing chest pains and coughing up blood. The unfortunate prognosis from the tests performed that day showed the cancer had returned not only in his leg, but also in his chest. There were numerous small tumors in his chest and one that was roughly the size of an orange which was attached to his lungs and heart. Many of the doctors Nick went to informed him that because of the massive size of the tumor in his chest, it was likely inoperable. The diagnosis was terminal, and the prognosis was grim. Although they helped prolong his life, chemotherapy and radiation had been shown to have little effect on this type of cancer. During this time, Nick received a grant from the Mary Crowley Cancer Foundation of Dallas Texas to perform a clinical trial for a new type of cancer vaccine. He was also able to find a specialist at Sloan Kettering who reluctantly agreed to operate on the large tumor, but told Nick that the surgery was extremely dangerous and had an over 85% mortality rate. In true Nick fashion, prior to the surgery on Monday, he prayed to the Lord with his parish on Sunday and proclaimed, “Let’s do this! See you all next week.” The removal of the tumor in Nick’s chest was successful, and 98% of the malignant tissue was removed, with radiation applied directly to the remaining tissue that could not be removed at the risk of Nick’s life. To Nick’s credit, strength, and faith, he kept his word and returned to an amazed group of parishioners the following Sunday. Nick’s struggle continued weeks later, as the tumor in his leg expanded at a rapid pace and caused him increasingly excruciating pain. In early August, it was determined that the tumor in Nick’s leg was growing too quickly for the vaccine to be effective, and that the vaccine could possibly better attack the cancer in Nick’s chest if the leg was removed. It was during this difficult time that Nick began to work on founding Support the Kid for Cancer, so that no matter what his fate, Nick’s legacy of strength, faith, and positivity would live on and be a shining light for others in difficult situations. On August 17, 2010, Nick once again went into surgery having his right leg amputated above the knee. Undaunted, Nick received physical therapy for several months and fought hard to learn to walk again while dreaming of eventually shredding fresh powder on his snowboard. In late September, Nick received a temporary prosthetic leg and began to painfully and slowly walk again. 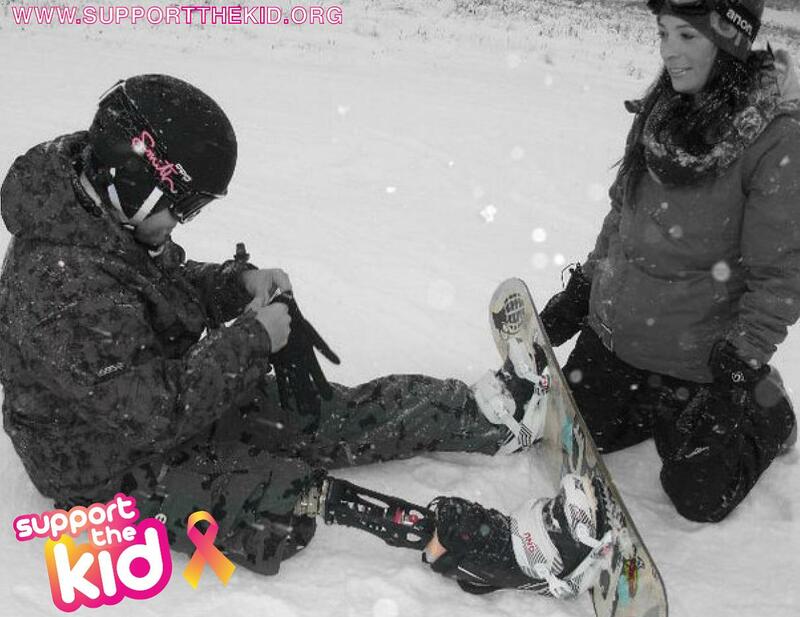 Thanks to the generous donations of friends and family, on November 25,, 2010, with one leg and the help of a specialized prosthetic leg, Nick realized his dream and was able to snowboard down the snowy slope of Stratton Mountain. Faced with a terminal prognosis and limited treatment options, Nick continued to keep his faith in the Lord, maintained a positive attitude and sought new clinical trials and alternative treatments. He left no stone unturned and dove into finding alternative options for curing his cancer while waiting for a targeted trial to begin in July of 2011. Although you would not often see the effects beyond a slight cloud across a smile, or a brief glimpse of a tired look cross his face, Nick fought his battle with cancer everyday with unrelenting strength. However, cancer is an insidious opponent and on March 12, 2011, Nick’s brave battle came to an end, and he passed on peacefully surrounded by his beloved fiancé, future in-laws, devoted parents and sister and brother, loving grandparents, many cousins, aunts, and uncles. Nick was an inspiration to so many people throughout his short life. He was able to evoke a reaction from those who just met him, but those lucky friends and family who knew him longest were truly blessed. He will be remembered for his love, generosity, and his determination to help others. Nick continues to fight the larger battle against cancer with his foundation Support The Kid for Cancer, where we are dedicated to realizing Nick’s dream to help children defeat cancer by any means necessary.